Butterfly Reflections, Ink. : Hello, Spring! Thanks so much for stopping by the blog today. I'm super excited to be sharing this card today, as I am totally in love with all things floral! 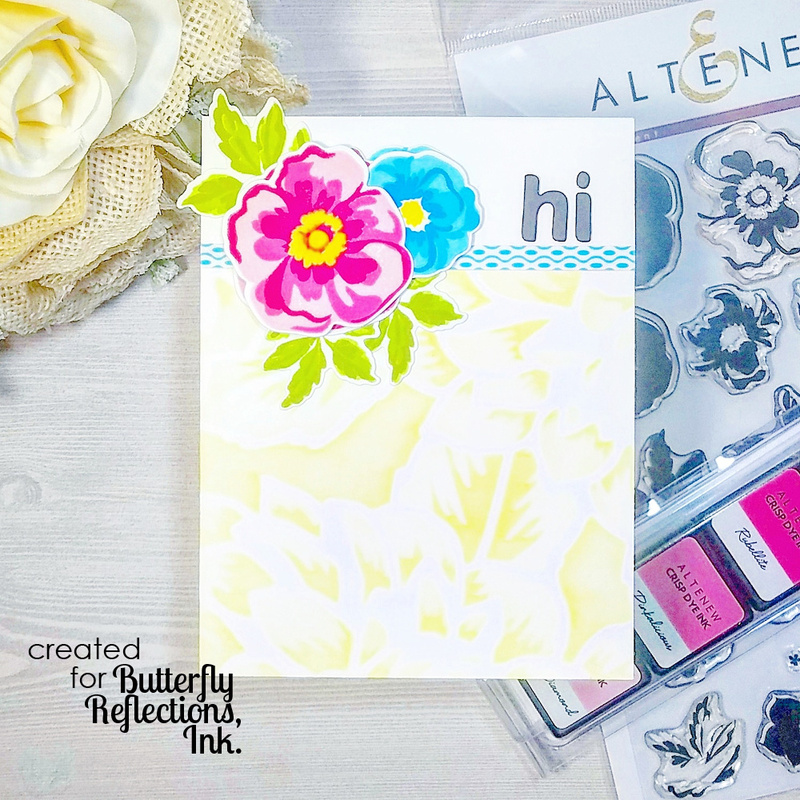 Altenew recently came out with this Floral Arrangement stamp set, and I had so much fun using it for today's card. I stamped out the floral images on white cardstock, using various Altenew ink cube sets: Cherry Blossom, Deep Blue Seas, Tropical Forest, and Pocketful of Sunshine. I also used the matching dies to cut out the inages and then I set them aside to work on the background panel. I used the Layered Dahlia stencils from Altenew and a couple colors from the Pocketful of Sunshine ink set to do the background. I wanted the background to be a little more subtle than the stamped floral images, so I used stencil brushes to apply the ink over the stencils. Do you ever dig through your embellishment drawer on a regular basis? I always forget that I have all these washi tapes, ribbons, twines, buttons, etc. And they are perfect little details for cards! I used a strip of blue washi tape that coordinated with the blue ink to give a defined edge between the stenciled portion of the background panel and the white portion. After the background panel was finished, I trimmed it down a bit before glueing it on to a scored 4.25 x 5.5 inch card base. I then trimmed down a scrap piece of white cardstock to fill out the rest of the card base and glued it on top. When the card base was finished, I took my floral images and arranged them on the card base to get an idea of how I wanted them to look. After I was satisfied with the layout, I used both my foam tape and also my liquid adhesive to glue the floral images in place. I used two layers of foam tape on some of the florals and one layer on others to give the look of dimension and depth. To finish off the card, I used the Altenew Simple Alpha die set to die cut a simple sentiment from black cardstock. I cut 4 or 5 layers and glued them all together to get a nice thick sentiment. I glued the sentiment on the top of the card, and called it a day! The happy colors of this card are making me long for spring--what about you??? 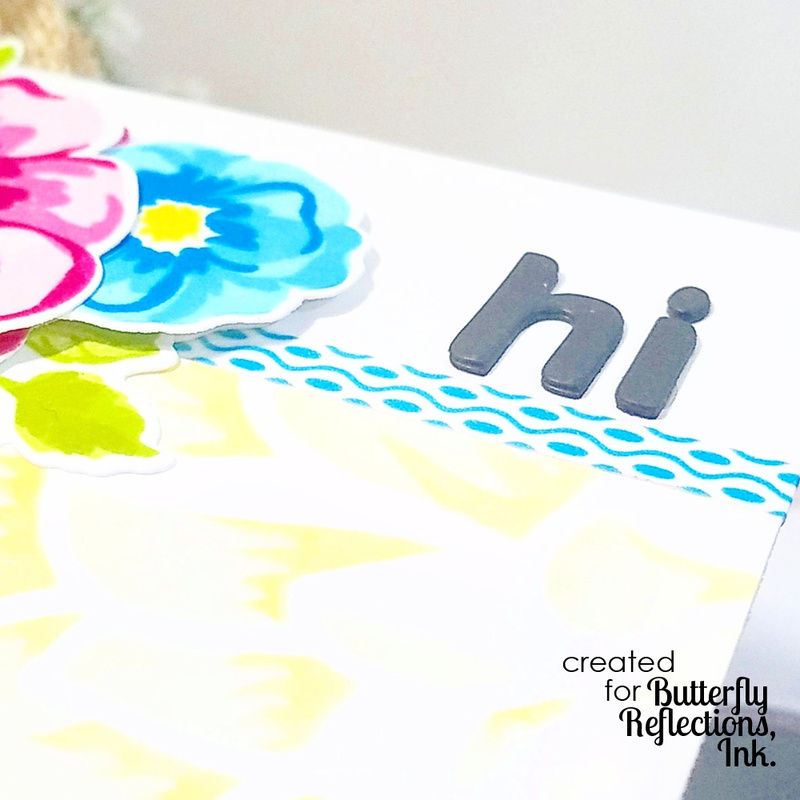 Thanks again for stopping by the blog today, and enjoy some crafting today!